It was in the 1970s that a few visionaries planted vines in the Wairau Valley in Marlborough. No doubt winemakers in the then traditional New Zealand breadbaskets of Gisborne and Henderson snorted with derision. Fast forward to the pink and grey 1980s and Cloudy Bay's seminal Sauvignon releases: this time, the world listened. And that land called Marlborough now encompasses the exciting Awatere and Waihopai Valley regions, and other little micro-climatic sub-regions as well, each turn of the soil, it seems, giving a slightly different expression to the fruit. Cloudy Bay, Spy Valley, Jules Taylor, Lake Chalice and Isabel Estate all hail from Marlborough, in case you were wondering that is. 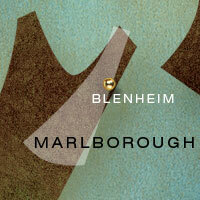 Wherever they hail, mighty Marlborough wines continue to win accolades and epithets and convert the world over.